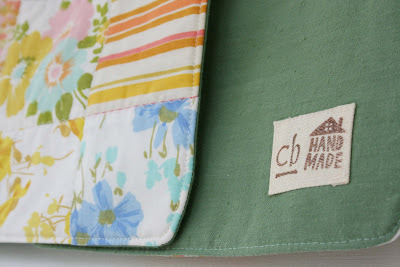 craftyblossom: sewing with vintage sheets. 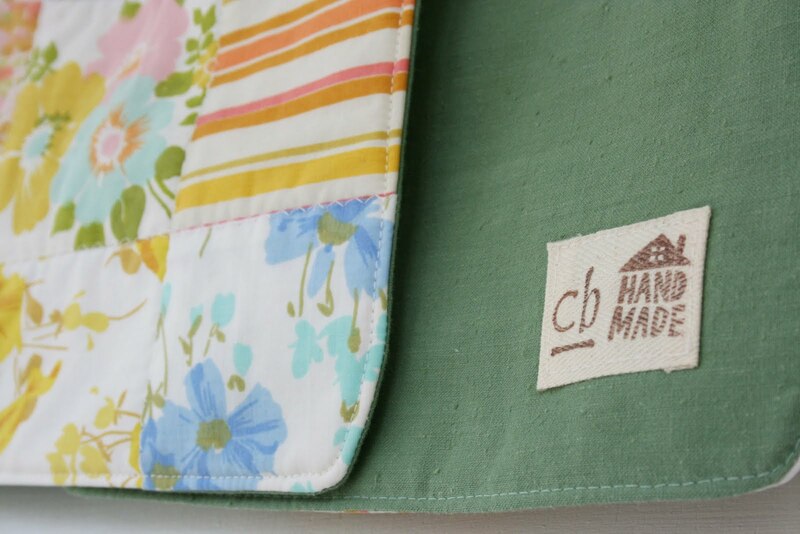 Vintage sheets just beg to be made into something fun and springy for a baby and now is the perfect time to do so. When I was cutting the squares, I grappled with continuing with my original plan or making a baby quilt. I still have quite a few squares left over so a quilt is definitely a possibility. I added a strip of ric-rac just for fun and I backed it in a pretty, nubby cotton in a fresh spring green color. As I was finishing up my third bib I realized that I have a serious problem: If I make one item and am happy with the outcome, I tend to make several. As I've mentioned before, I believe that in a past life, I spearheaded the industrial revolution :) Just kidding, but please tell me I am not alone! Only one of these is intended as a baby gift for a newborn. Perhaps I'll try to get a little booth at the local art fair this summer and try and rid myself of my box (and crate, closet and chair) of my wares, tangible proof of my problem. Sweet bibs, love the rick rack touch :) I don't sew usually more then one item, unless I have to, but I do have a problem buying in threes. Usually it happens when I find a shirt I like, then I need two more in different colors! hahaha, weird right? These are so cute! 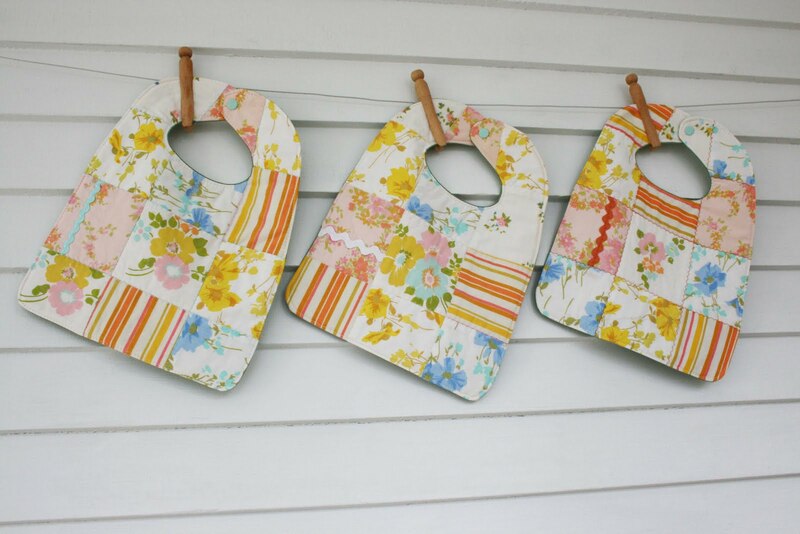 What a great project to use up vintage sheets. I love your assembly line process. Sometimes I do that, but not too often. I'm more of a one-of-a-kind gal, even if it's just a small tweak to shake things up a little. Cute! I just made a couple of vintage sheet blocks today. I always want to make more than one, but often get sick of the process midway through the second item. Big time second-sock-syndrome. Those bids are adorable. I still think a quilt would be great in those vintage sheet blocks as well. I'm usually a one-of-a-kind girl myself. I get bored easily and the only time I make more than one of the same thing is if someone requests it and really urges me to do it. Even then, I change it up a little. ha! yeah, for a crafter - the perfect spring cleaning is a booth at an art fair! you are not alone!! i tend to repeat the things i love and that are easy for me to make. these little bibs are so cute. what a awesome way to use vintage sheets. The bibs are adorable. I usually work in multiples; after all, you have everything out and ready to go - it's only logical to go into production. Those bibs almost make me want another baby so that I could use one!!. Or maybe that Izzy was still young enough to use a bib. They are gorgeous, I love the vintage florals that you used to make them....they all complement each other very nicely. So cute! Prefect for a baby girl. I think you would be so successful at a Saturday/Farmers Market! You should go for it. Gush. What a seriously lucky Mama and baby to get these pretties. I love vintage sheets too. And hey if you make something you like why not crank out a bunch! Everything you make is just so cute! I love these bibs! I know how you feel about getting addicted to making the same thing repeatedly. When I find something easy and quick to make, I just can't help making several of them. p.s. Your new pink quilt is super cute! I want one just like that!! !